What in the World is a Carnegie Unit? For most people, the words “Carnegie Unit” cause a blank stare. Yet, these words have meaning for the every day lives of high schoolers all over America. You see, the Carnegie unit is a reference referring to time. It is used to measure educational attainment for secondary school education. Historically, the Carnegie Unit is “120 hours of class or contact time with an instructor over the course of a year at the secondary (American high school) level.” (Wikipedia) This, in reality, is an hour per day five days a week for 24 weeks, or as most high schools do, 50 minutes per day 5 days a week for 30 weeks. A two semester course will yield 1 whole Carnegie Unit while a one semester course will yield the student ½ Carnegie Unit. These units were designed as a way to standardized the educational process. This enabled schools across the country to give the same amount of education over the course of the year for the same amount of high school “credit.” Charles W. Eliot organized this idea, and in 1894 the National Education Association endorsed this standardization. So, how does this translate to homeschoolers? If we look at this literally, then it should mean that we must spend 180 days of study in a particular subject at the rate of 50 minutes per day, five days per week, and thirty weeks per year. For many homeschoolers, their particular state requires a 180 school day calendar. However, the amount of time spent on each subject per day can get rather subjective. With that in mind, we all know that high school courses have interruptions, discipline problems, and many other things that take away from the full 50 minutes of instruction per day. In reference to the example from Georgia, that state is expected somewhere between 135 and 180 hours of instruction for each Carnegie Unit granted. The purpose of the Carnegie Unit is to streamline and standardize the educational process for college entry. It is very important that homeschoolers find out their state’s guidelines. This will give guidance as to how many hours of instruction are required for each Carnegie Unit the student earns. 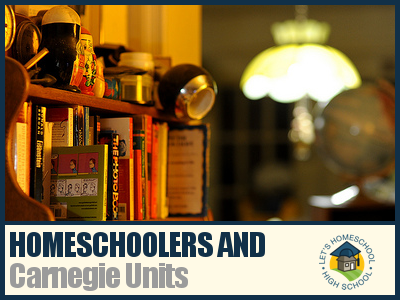 So, following your state’s guidelines, and keeping in mind what the Carnegie Unit consists of – homeschoolers can wisely grant student’s credit where credit is due! In this and many other websites, I easily get the definition of Carnegie Unit as it applies to public school. But how does it apply to home school? Are we assuming that public schools assign home work in addition to the 120 hours classroom time? I have been told to figure 200 hours for a home school high school English credit. Is that number a little high? My state does not require Carnegie units, but I would like to know what I am shooting for when I make English plans for my student. Great article. I'd heard of Carnegie Units, so this article pulled everything together for me.